In my neck of the woods, sweet corn is in season. Hooray! The problem is, the season for fresh sweet corn seems to last about 5 minutes (OK, maybe 2 or 3 weeks) and then it’s all gone. 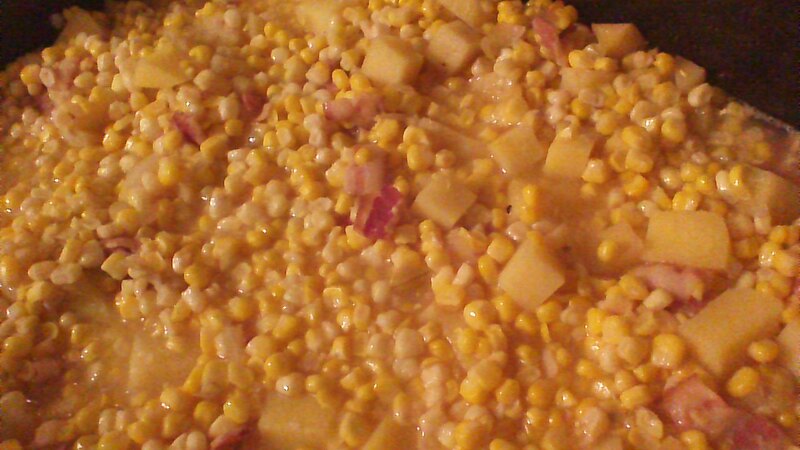 😦 Corn and Bacon Chowder freezes well, and is a great recipe for preserving the awesome flavor of fresh sweet corn to enjoy all winter long. I make BIG batches of this soup, based upon a recipe found in an old Better Homes & Gardens cookbook, to stock my freezer. The recipe below makes a smaller quantity, but can be easily doubled. Let’s get started! A triple batch of chowder in a giant slow cooker! Step 1) Toss bacon pieces into a soup pot and fry until crisp. Remove bacon from the pot and set aside, but do not wash the pot! Step 2) Add diced onion to the bacon drippings in the pot, and sauté for 5 minutes, stirring constantly to prevent scorching. Step 3) Add corn kernels, potato cubes, and chicken stock to the pot. Bring to a boil and then reduce heat. Simmer gently, covered, until potatoes are very tender. This will take 20 – 30 minutes. Step 4) Remove from heat and allow soup to cool, uncovered, for 5 – 10 minutes. Use an immersion blender to blend the soup for 2 SECONDS. Only 2 seconds! Your goal is not to puree all of the soup into a bisque, but simply to puree a tiny bit of soup to give the broth a rich, full body. Don’t get carried away! Step 5) Just before serving, stir in light cream, paprika, salt, pepper, and crispy bacon pieces. Serve with Cocoa Chili Cornbread for an added treat! NOTE: If you are freezing this soup (which I recommend! ), don’t add the light cream. Instead, add the light cream after you thaw the soup and just before serving. This entry was posted in Soups and Salads and tagged autumn, Bacon, chowder, Cooking, corn, dinner, Family, Food, frugal, Garden, Green, harvest, Homesteading, Recipes, soup. Bookmark the permalink.